The UPR is an opportunity to evaluate, every four and a half years, each UN member State’s performance in the field of human rights. Although this is not the first UPR for China, the Chinese response to the recommendations oriented toward avoiding human rights violations in its investments abroad, it constitutes an event without precedents for China and for the world. From the beginning of the century, the Chinese State has put into work a strong financial and diplomatic machinery to capture extractive and infrastructure projects in the entire world. In this way, in Latin America and the Caribbean (LAC), banks and Chinese enterprises have become determinant actors for the enjoyment of human rights of large social groups because they have facilitated the financing, and construction of, hundreds of mining, oil extraction, hydroelectric, and transportation infrastructure projects, many of which have caused serious environmental and social issues for thousands of people. “ With this, China has accepted that the obligation to protect human rights is not only with the States in the countries where projects are carried out but also with the Chinese corporations and investors that execute and make them viable; but in addition, the Chinese State will have to report back to the UNHRC on this,” Julia Arcos from CooperAccion (Peru) pointed out. In fact, China will have to report in two years to the UNHRC, during its Mid-term Review, on the progress made on the implementation of the UPR recommendations. Apparently, and according to the commitments undertaken with the UNHRC, China has the task of developing an action plan to ensure that its investor companies respect the rights of local communities and the environment. “This commitment should not be considered as a paper promise; to the contrary, social organizations everywhere in the world should take the word of the Chinese State, keep vigilant and report to the Chinese embassies and the UNHRC when violations take place in Chinese projects, and demand reparation for the violated rights of the victims and the environment,” said Maria Marta Di Paola from FARN (Argentina). 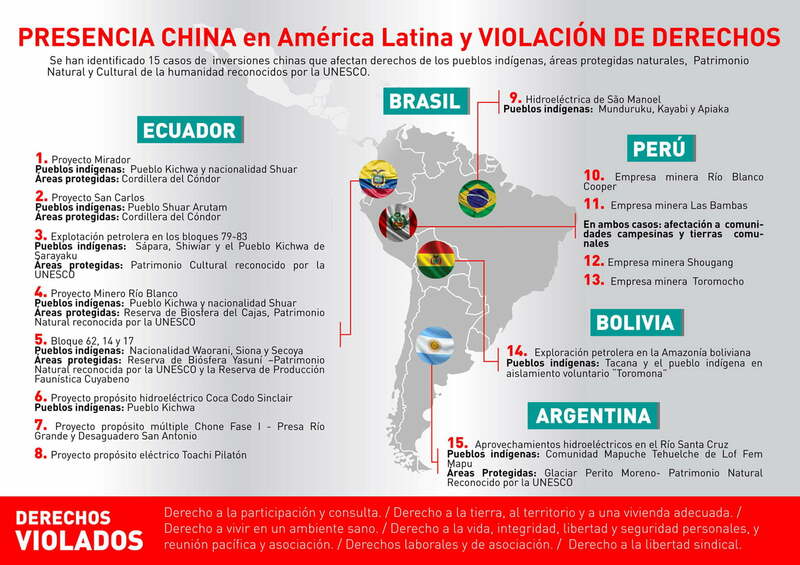 In the past year, the Collective on Chinese Finance and Investment, Human Rights and the Environment (CICDHA) by its acronym in Spanish), in the context of the UPR, presented (along with 15 Latin American NGOs) a report which examines 18 projects with Chinese participation in Ecuador, Peru, Bolivia, Brazil and Argentina. The report found that companies and banks have systematically violated rights protected under the Universal Declaration of Human Rights and other UN instruments. According to Sofia Jarrín from CDES (Ecuador) and the Coordinator of CICDHA, “For more than a year, we have worked intensely in collaboration with the affected communities collecting information, delivering it to the diplomatic missions and to the media because we considered that the UPR was one of the few opportunities to get national governments and China to commit to change” and that “the fact that diplomatic missions have listened to us, and that China has listened to the missions, just steps in a long road to achieve the full compliance with human rights in the context of Chinese investments.”Nevertheless, China’s UPR also highlighted a series of human rights violations at the domestic level, especially related to the Tibet and Xinjiang’s ethnic minorities, human rights defenders, and freedom of expression. These were the most observed subjects and the ones to which China made the least number of commitments. As CICDHA “…at the same time that we recognize this historical progress from China regarding extraterritorial responsibilities, we also express our solidarity with the Chinese population that suffers severe human rights abuses. We definitely do not believe in a human rights approach with Chinese characteristics, which the Chinese State has pointed out, attempting to dilate its obligations. Human rights are, in principle and in practice, universal.” concluded Caio Mota from Protect the Amazon (Brazil). *The Collective on Chinese Finance and Investment, Human Rights and the Environment (CICDHA) includes the Center for Economic and Social Rights (CDES, Ecuador), the Center for Documentation and Information (CEDIB, Bolivia), the Foundation for the Environment and Natural Resources (FARN, Argentina), Protect the Amazon (Brazil) and CooperAccion (Peru).